When the snow melts, ski resorts turn their attention to summer fun. Sunday River in Maine offers mountain biking, their Mountain Bike Park first opened in 1991, one of the first New England ski resorts to do so. The Chondola is open Friday – Sunday 10am – 4pm in summer for rides. Sunday River mountain bike park has 30 mountain bike trails, over 25 miles, from intermediate to advanced and technical and experts only. The newest trails, Tango and Crash and Not Trail – a single track for experts under the Chondie. Beginners can get in gear on Lazy River or the half mile Easy Tiger. More challenging trails include Grease Monkey, Moose Tack, Tombstone and the Crater Trail which bikers can enjoy with lift service back up. Sunday River has also developed a BMX style track with rhythm sections and table tops. Zip Liners will enjoy Sunday River’s 6 zip lines as long as 300-feet on the ski trails ski trails of Mixing Bowl, Tourist Trap, Outta Here, and Thataway. Sunday River summer tickets for The Chondola, biking, and zip line are available at the South Ridge Lodge. Trails and lift service are open Friday – Sunday 10am – 4pm. Scenic chairlift rides for those on foot are also offered. 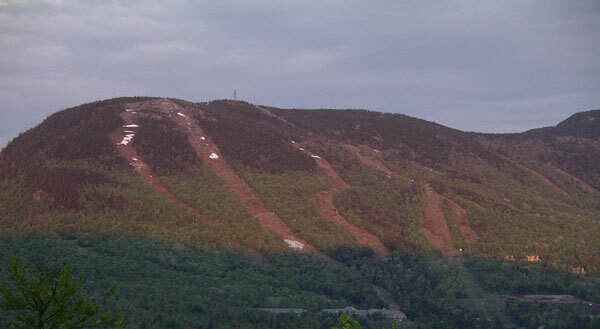 Sugarloaf in Maine also offers Championship Golf and zip lines tours open in the fall and winter as well. Other ski resorts in New England that offer mountain biking include Mount Snow, Burke Mountain, and Stratton. For an alpine adrenaline rush in summer, Gunstock and Bretton Woods Zip Line and Canopy Tours are among two of the longest in North America. Gunstock’s Zip Line offers the longest span in the US – and arguably the most scenic overlooking Lake Winnipesaukee. Gunstock ski area transforms into a hiker and bikers playground, with segue tours, an aerial treetops tour and You can segue, hike and mountain bike on Gunstock with fantastic views of the Presidential Range and Mt Washington. Read our Gunstock Zipline review. Stowe, Wildcat, Cranmore, Okemo and Loon all offer zip line rides, scenic and exhilarating all at once. Attitash, Cranmore, Jiminy Peak and Okemo all offer a Mountain Coasters. Jiminy Peak in Massachusetts has an entire Mountain Adventure Park with a Kids Zone featuring the new Spider Web and Rope Adventures, a Mountain Coaster, as well as a new miniature golf course. For little kids, the Ponderosa Playground and Bounce House are perfect. Smugglers Notch Resort in Vermont is a family fun zone in summer, with Zip lines, swimming holes, rope swings, and water parks galore. Smugglers summer day camps for kids are award winning in winter and summer too. Camp counselors take you kids hiking, on nature walks, and on adventure ropes courses.